David Hughes, a retired Special Branch spymaster, is slowly losing his mind at the same time as he’s beginning to be haunted by ghosts. Having run a network of Republican informers throughout The Troubles in Northern Ireland, Hughes has deep knowledge of where the skeletons are buried on both sides, knowledge that could upset the peace process. Both Special Branch and the IRA want him to hold his silence, but can he be trusted to keep his secrets now that he is suffering from Alzheimer’s disease? Shortly after one of Hughes’ informers, Joseph Devine, is found dead, Hughes disappears. Recently returned from Scotland, Inspector Celcius Daly is assigned both cases. He quickly makes a connection to Oliver Jordan, murdered twenty years earlier by the IRA for being a suspected informer. But then Daly starts to become sidelined as Special Branch take a more active role in the investigations. Their view is the truth is sometimes best left buried, whereas Daly believes in justice regardless of the potential consequences, a position that few of his colleagues share given their experiences of the Troubles. He continues to hunt for Devine’s killers and to locate Hughes, but all he seems to find are ghosts. The premise for Disappeared is a compelling one: what happens to secrets, informers and controllers when a dirty war ends and a peace process unfolds? What happens to families who are tainted by lies, deception and compromises, who want to know the truth about their loved one’s death and to recover the body for formal burial? And what would be the consequences of key players seeking atonement for past actions or breaking their silence to reveal damaging truths? 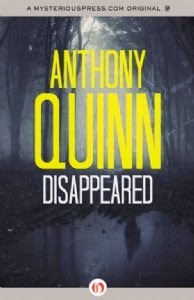 Quinn places the reader in modern day Armagh and the coastline of Lough Neagh to explore these questions, showing how wars never really end, but tail away in a set of ugly cover-ups and revisionist history making. It takes a few pages for the plot to find a sure path, but then the story unfolds through a compelling narrative. This is aided by just the right mix of characters with suitable back stories, and some nice interchanges as they dance around each other, all seeking a satisfactory resolution, but not one they share. The characterisation of Hughes, with his developing Alzheimer’s, Inspector Daly, and Dermot Jordan, the son of an IRA member murdered for being a suspected informer, are particularly nicely done. Throughout, Quinn evokes a strong sense of place and history. Overall, a thoughtful and engaging read. I’ll definitely be reading the next book in the series. This book sounds fascinating; I will put it on my list to look for. Although I am not thrilled about reading books featuring Alzheimer's, as both my parents suffered from dementia, it sounds like a worthwhile read. Tracy, it doesn't dwell on the Alzheimer's and I think you'll find it a thoughtful read.